Email marketing has been declared dead by most people in the industry since the emergence and fame of social media marketing. Considered as an old fashion technique, it’s been absolutely discarded by modern content marketers. Unfortunately, they lose their connection with people, in fact decision makers, who like to keep their conversation private. These are such people, especially the ones at higher positions, who still like to go the old way and want to receive product information in a more personal environment – their email inbox. So, it will be wrong to declare email marketing dead. It’s true that it may take longer to connect with the audience. But once they start reading them, it means they are looking for more of them. However, marketers should understand that they shouldn’t bombard them with frequent emails, sounding desperately salesy. Rather they should give their audience some time to consume and digest the information in previous email before pushing another one. As emails provide marketers with the most direct means of sales conversation, they should be carefully designed. Let us see what makes your email marketing campaign work better in the times when it is declared dead by most marketers. What Makes an Email Work? How many times has it happened to you that you simply press “delete button” without even opening an email? Most of the times, I think! You’re not the only one who does this. Your audience does the same. What makes you trash an email without even opening it? Because they sound soullessly salesy or their headline is not attractive! True, same is the case with your emails. All depends on how you present yourself in front of your readers. Good and niche specific content with a distinctive presentation style and genuine message addressing the needs of readers. The way you draft and organize the content of an email matters a lot. This inspires them to read and share your emails. Do you start selling your items as soon as you meet a person? No; you try to build a repo and establish a connection before you start with your pitch. 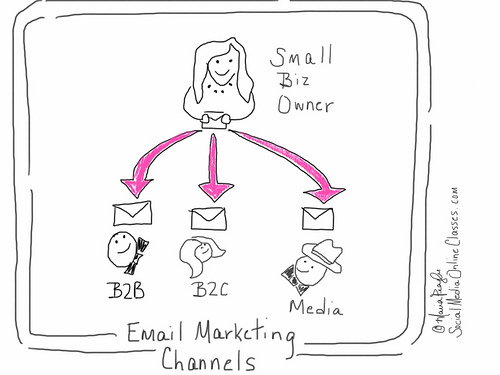 Same is true for your email marketing campaign. You need to send your relationship manager before introducing your sales guy to your audience. Don’t out rightly bombard them with a characterless self-promoting mail that sounds like a spam. Let your audience take time to open up and be receptive. Build trust and credibility and then think of promoting your products. A heartless sales email will never work. This is the most common reason why an email is directed to trash as soon as it is received. It should sound useful, unique, extremely specific and urgent. A great subject line is what makes recipients open an email and see what it says. This is the very beginning of your email marketing campaign. The first requirement to make your campaign a success is to get it right. Understand that you’re trying to steal the valuable time of your audience. You really can’t afford to look dull and senseless. Incorporate utility, context, value and uniqueness in your subject line to ensure greater clarity. Don’t be obsessed with your email marketing campaign. Be patient not to push your emails very frequently. Even if your content is good, people won’t read them everyday. Whenever you push an email, remember that it’s going to be read by people. So, try not to sound soulless and senseless. Previous post How to Persuade Your Customers to Buy? Next post Are you making these landing page mistakes?